Medlars not only produce very unusual fruit of medieval origin but they are also beautiful flowering trees, the blossom is reminiscent of wild blush pink rose flowers. The Autumn brings a perfect seasonal combination of russet brown gold fruits set amongst the foliage of strong red and gold autumnal hues. The unusual fruit can be used in a number of ways to flavour jellies or used in desserts. However - We think the best way to enjoy them is to blet them (leave until just over ripe), light a roaring log fire, bring some good Stilton cheese to room temperature, poor a glass of port and enjoy! An Interesting Medlar of heritage interest being the Medlar planted by Elizabeth Garrett Anderson the first female doctor in the country and a good quality fruit to boot. Medium size pear-shaped fruit up to 25mm in diameter. 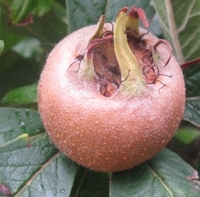 It is considered to be the best-flavoured medlar, suitable for growing as a bush or a pyramid. Cropping is very heavy and plants will produce a good crop when only 3 years old.